March 28, 2016 – Step through the Guardian of Forever and back in time to colonial North America, in the heat of King William’s War. Our guide on this journey is Jay Atkinson, called “the bard of New England toughness” by Men’s Health magazine for his approach to writing and his topics. 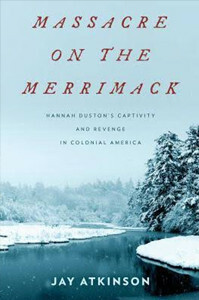 He shares the story of another tough New Englander in his new book, Massacre on the Merrimack: Hannah Duston’s Captivity and Revenge in Colonial America . Early on March 15, 1697, a band of Abenaki warriors in service to the Catholic French, raided the Puritan English frontier village of Haverhill, Massachusetts, killing twenty-seven men, women and children, and taking thirteen survivors captive. Hannah Duston and her one-week-old daughter, Martha, were among these survivors — and it is there that our story begins. Jay Atkinson teaches journalism at Boston University, as well as a critic, essayist, investigative journalist, and itinerant amateur athlete up in Methuen, Massachusetts. He is also the author of the author of two novels, a collection of short fiction, and five nonfiction narrative books including Ice Time and Legends of Winter Hill . You can visit his website, JayAtkinson.com, follow him @Atkinson_Jay on Twitter, or drop him a like at Facebook.com/WriterJayAtkinson.